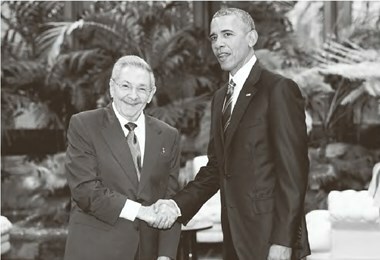 Cuban President Raul Castro, left, shakes hands with U.S. President Barack Obama during a meeting in Revolution Palace, Monday, March 21, 2016. HAVANA – Cuban President Raul Castro called on President Barack Obama on Monday to lift longstanding U.S. trade and other restrictions as he and Obama pledged to move forward with normalizing relations between Cuba and its longtime Cold War- era foe. “This is a new day,” Obama said, standing alongside Castro after their meeting at Havana’s Palace of the Revolution. In a history-making meeting in Havana, Castro praised Obama’s recent steps to relax controls on Cuba as “positive,” but deemed them insufficient. He called anew for the U.S. to return its naval base at Guantanamo Bay to Cuba and to lift the U.S. trade embargo. “That is essential, because the blockade remains in place, and it contains discouraging elements,” Castro said. As Castro prepares to step down in 2018, he’s held firm against any changes to Cuba’s one-party political system.